Keystone/Getty Images; Chip Somodevilla/Getty Images; Win McNamee/Getty Images; Samantha Lee/Business InsiderWhich presidents share your sign? Some zodiac signs are more presidential than others. 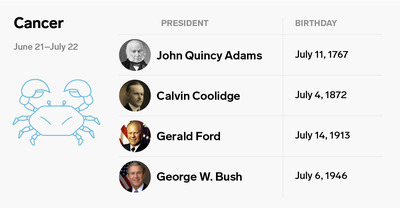 Aquarius and Scorpio were the two most popular among the 44 US presidents. Virgo and Aries were the rarest signs. But, all in all, the presidents were spread out across the board when it comes to their horoscopes. The United States is currently being run by a Gemini. That’s right. US President Donald Trump was born on June 14, 1946, toward the tail end of Gemini’s horoscope range. To recap, twelve astrological signs make up the classic Western zodiac, which dates back to ancient times. Sun sign astrology, which focuses on the position of the Sun on your birthday, took hold in the 20th century. It seeks to link each astrological sign with vaguely-worded personality profiles. 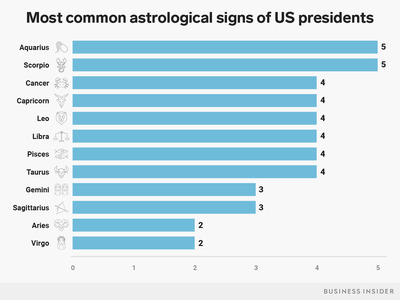 So can these astrological symbols tell us anything about the tenures of individual US presidents? 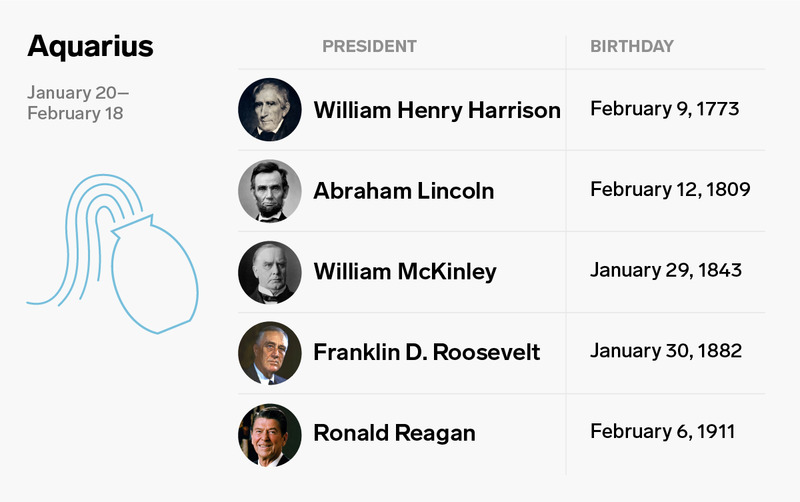 But, whether you think horoscopes are fluff and nonsense or you religiously check if Mercury is about to retrograde, it’s fun to look back on what constellation each president was born under. 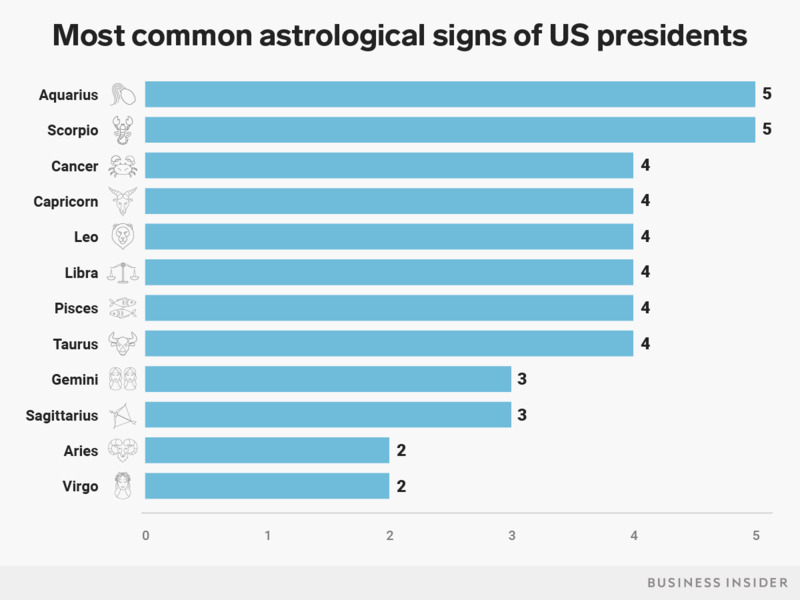 When it comes to the frequency of presidential zodiac signs, Aquarius and Scorpio are tied for first. 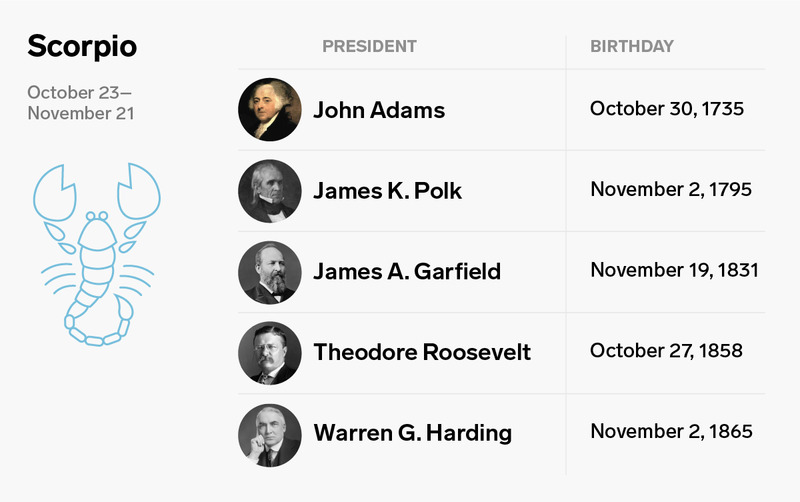 Five presidents were born between January 20 and February 18, and five presidents were born between October 23 and November 21. 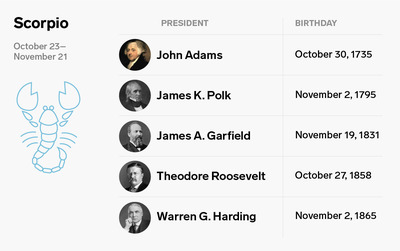 Meanwhile, Aries and Virgo proved to be the rarest zodiac signs among the 44 presidents. What about the sign of the water-carrier is so seemingly presidential? Well, those born under Aquarius are characterised as smart, stubborn, and brutally honest, according to INSIDER. But, strangely enough, four of the five Aquarius presidents died in office. William Henry Harrison succumbed to a pneumonia a month into his tenure. Franklin D. Roosevelt died 11 weeks into his fourth term, just months before the end of World War II. Assassins’ bullets cut down both Abraham Lincoln and William McKinley. Ronald Reagan was the lone survivor of the bunch, although he was shot in the chest in a 1981 assassination attempt. 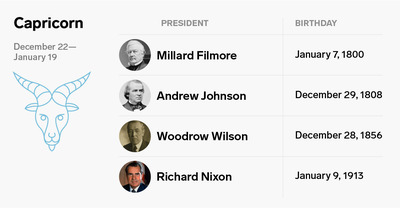 Pisces presidents had a good run for a while. George Washington, the first US president, was born under the sign of the fish. This zodiac is linked with dreaminess, good judgment, and impracticality. 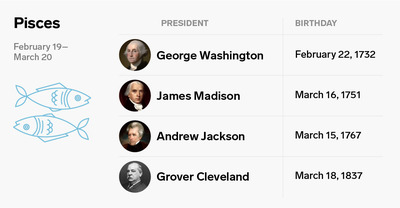 James Madison and Andrew Jackson followed Washington. Decades later, another Pisces – Grover Cleveland – became the first and only president to ever serve two non-concurrent terms. But, since Cleveland left the White House in 1897, it’s been a dry run for Pisces. Thomas Jefferson and John Tyler had a lot in common, aside from both being Aries. Both hailed from politically-connected Virginia families. Both attended the College of William and Mary. And Tyler’s father – Judge John Tyler Sr. – was friends with Jefferson. Those born under the sign of the ram are said to be spontaneous,intense, quick-to-anger, and dismissive. Those born under Taurus are said to be dependable, practical, and a bit stubborn. 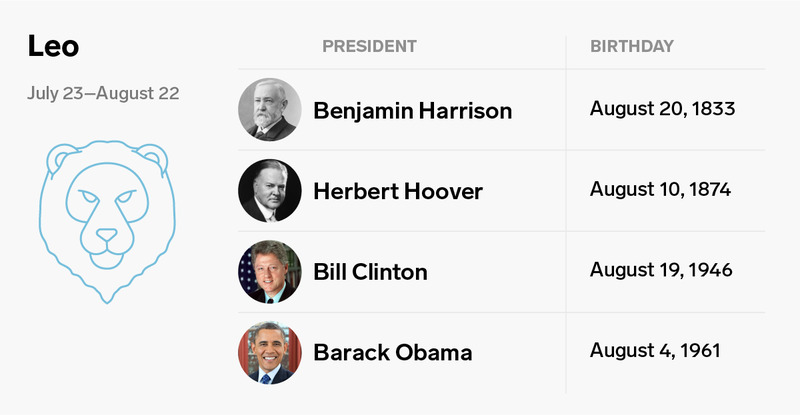 But these bullish presidents are a decidedly mixed bag. 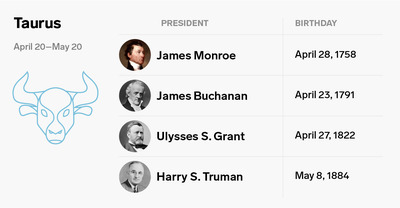 James Monroe and Harry Truman both fare quite well in most presidential rankings. Ulysses S. Grant’s service in the American Civil War is widely well-regarded – certainly more so than his corruption-riddled White House tenure. 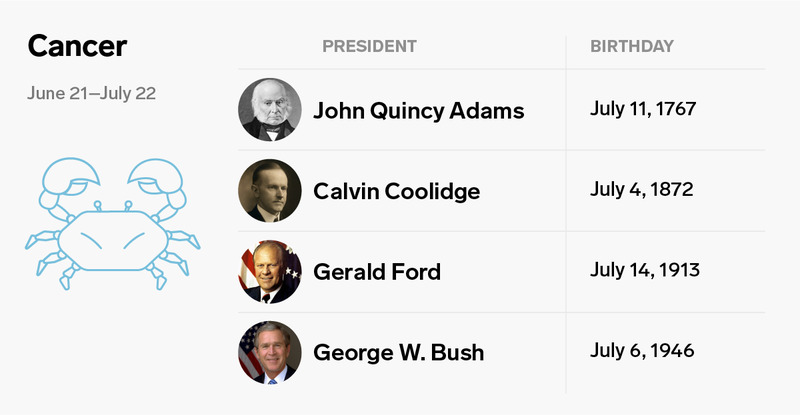 But James Buchanan is consistently ranked as one of the worst presidents of all time. His inaction and pro-Southern opinions are cited as disastrous, in the face of the outbreak of the American Civil War. 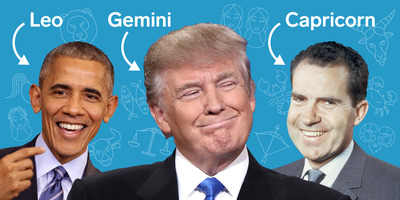 The current president – Donald Trump – is a Gemini. Those born under the sign of the twins are known for being chatty, sociable,repetitive, and sometimes a bit two-faced. 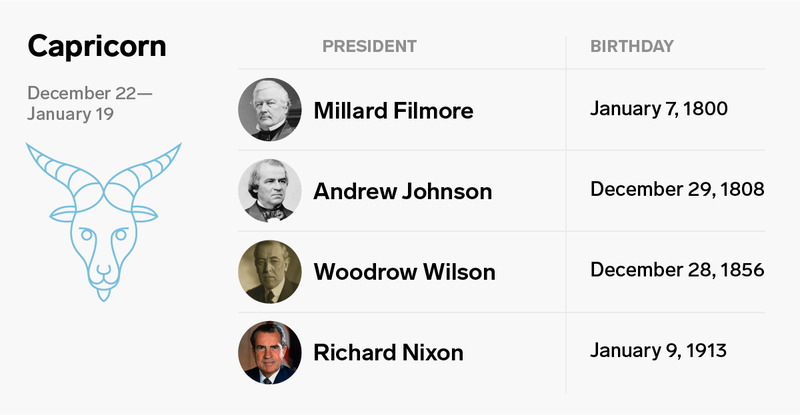 You won’t find any Gemini presidents pop up until the 1960s. The trio of Gemini presidents – which also includes John F. Kennedy and George H.W. Bush – are all relatively modern. Cancers are said to be loyal, sensitive, tenacious, and needy. 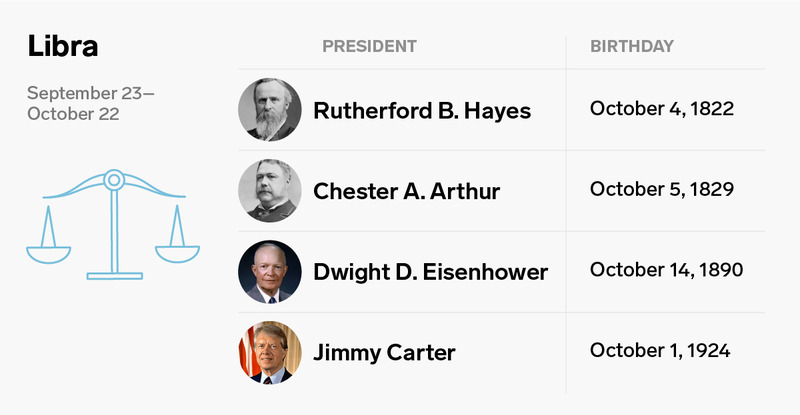 And these astrologically crabby presidents have been a mainstay in the White House throughout US history. John Quincy Adams, the sixth president, was a Cancer. Presidents born under the sign of the crab dotted the twentieth century, including Calvin Coolidge, Gerald Ford, and George W. Bush. Leos haven’t made up the lion’s share of presidents, but they have built up a solid pride, nonetheless. Both Barack Obama and Bill Clinton, the two most recent Democratic presidents, were Leos. So were Herbert Hoover and Benjamin Harrison. Leos are characterised as being fun, friendly, positive, dramatic, proud, and attention-seeking. 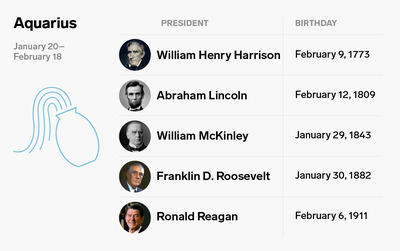 Virgo is one of the least popular zodiac signs when it comes to the US presidents. The sign of the Virgo is said to indicate perfectionism, shyness, and kindness. Only William Howard Taft and Lyndon B. Johnson were born under the sign of the maiden. The presidential Libras are anything but politically balanced. 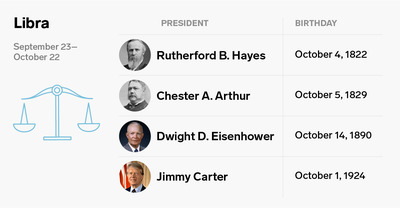 Jimmy Carter is the one Democratic outlier in the White House astrological quartet. The other three – Rutherford B. Hayes and Chester A. Arthur, who served back-to-back, as well as WWII-general-turned-politician Dwight D. Eisenhower – ran on the Republican platform. Being born under the Libra sign is supposed to indicate sincerity, disorganization, and a penchant for carefully weighing choices. 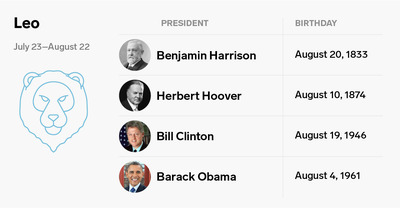 Scorpios make a good showing throughout the US presidency. Founding Father John Adams and Manifest Destiny-proponent James K. Polk were Scorpios. The sign of the scorpion also fell upon assassination victim James A. Garfield and Warren G. Harding, who died in office just before a massive corruption scandal broke. And then there’s the ever-popular and highly-ranked Theodore Roosevelt. Scorpios are known for being passionate, brave, intimidating, manipulative, and fearless. Back in 2017, the Huffington Post reported that Scorpio was the sign most common among world leaders. 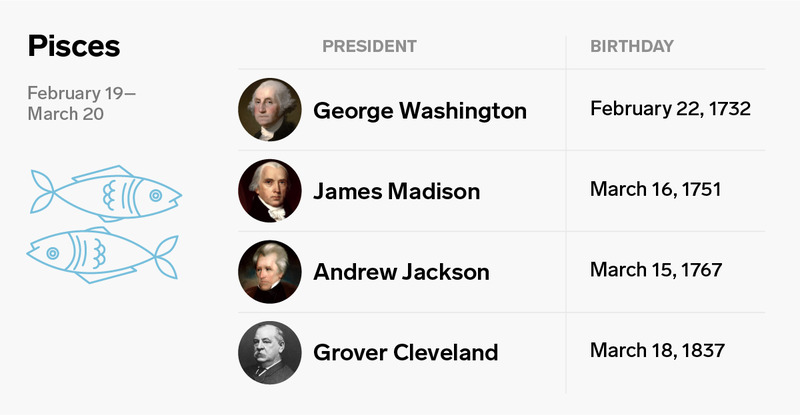 Martin Van Buren, Zachary Taylor, and Franklin Pierce aren’t exactly the most famous presidents in history. But they are all born under the Sagittarius sign. So what traits do these straight arrow presidents allegedly display? Apparently, idealism, generosity, adventurousness, and obnoxiousness define those tied to the astrological archer. Capricorns are said to be hardworking, disciplined, and self-righteous. But some of the Capricorn presidents have left a mixed legacy, to say the least. Millard Filmore was a member of the anti-immigrant Know Nothing Party and enforced the Fugitive Slave Act. Andrew Johnson faced impeachment for his efforts to torpedo Reconstruction in the wake of the American Civil War. Woodrow Wilson is remembered less harshly in most rankings, but his racist legacy has spurred protests at Princeton University, where he once served as president. And, in the aftermath of the Watergate scandal, Richard Nixon became the first president to resign from the office of the presidency.